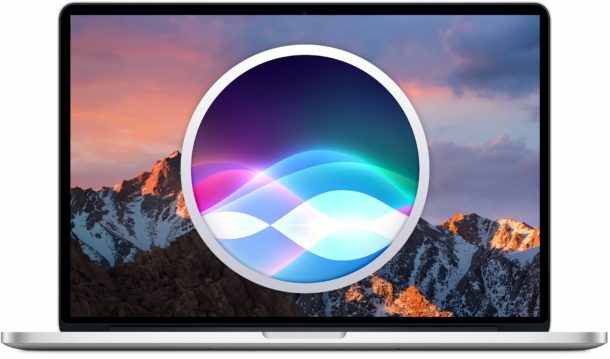 Now that macOS Sierra has Siri built directly into the Mac operating system, you’re probably wondering what exactly you can do with the handy virtual assistant on your computer. It turns out that Siri has many abilities unique to the Mac, which you can’t perform on an iPhone or iPad with the virtual assistant. 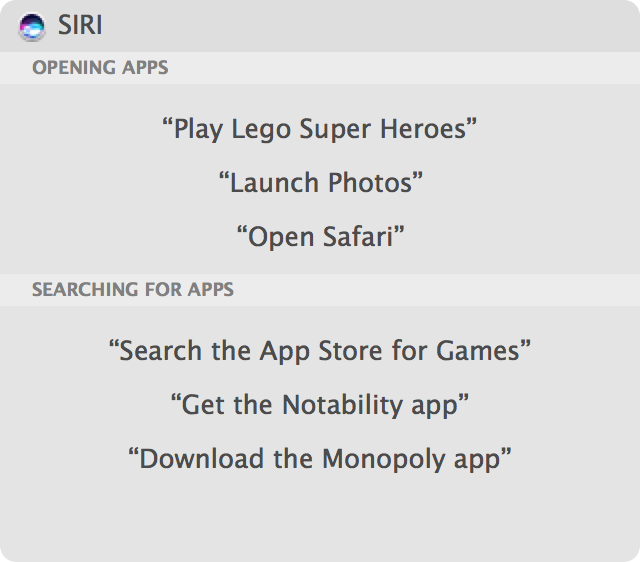 Of course nearly all of the traditional Siri commands from iOS work in macOS as well, which is just one of many reasons we think Siri is one of the features in macOS Sierra that you’ll use most. 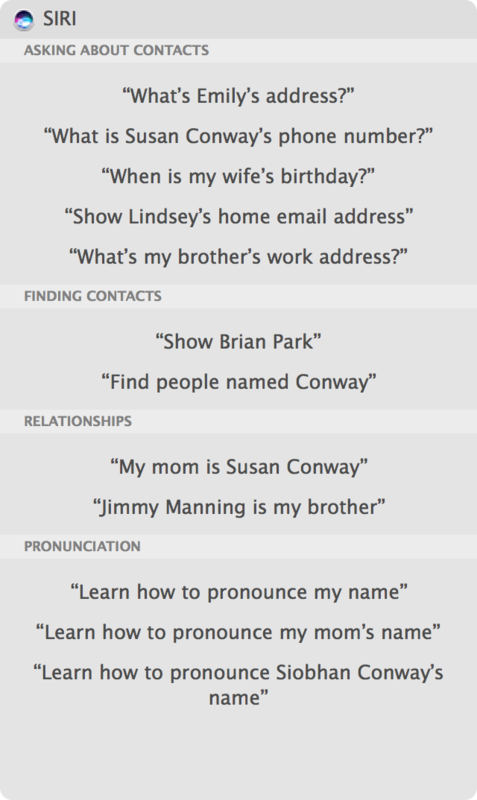 Before issuing commands to Siri, you’ll want to summon the virtual assistant. The easiest way to do this are by clicking on the menu bar item in the upper right corner, the Dock icon, or by hitting the Option + Spacebar keystroke. When you click to activate Siri, Siri will stick around until you either click the icon again or close the Siri window in the corner of the display. 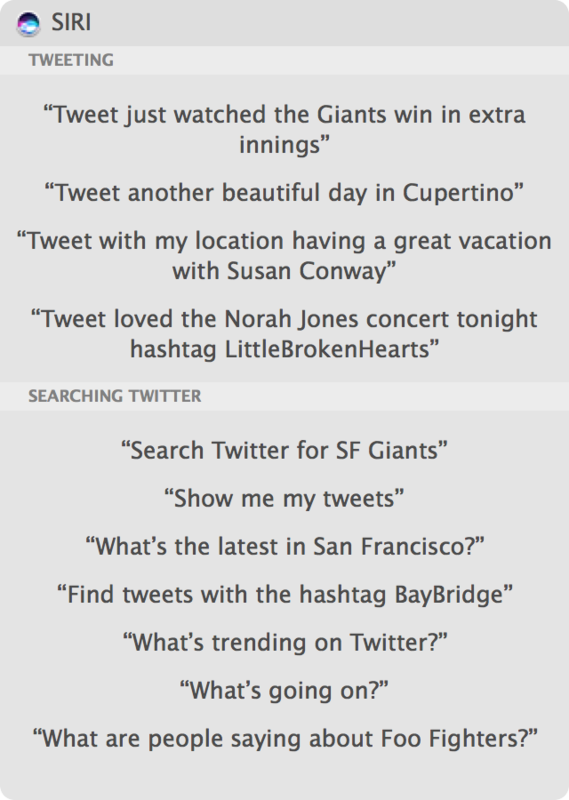 Now that yo just a taste of the type of commands Siri can perform on the Mac. You can substitute obvious things as well, for example you can ask about different settings or preference panels, Wi-Fi instead of Bluetooth, any application the Mac, ask to show any file type or document name, and so much more. 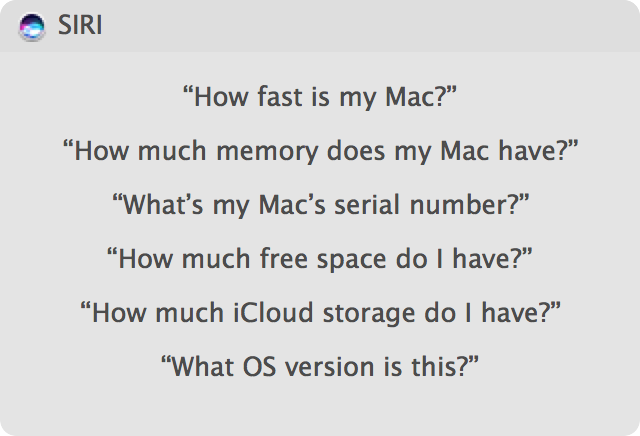 How much memory does my Mac have? What is my Mac serial number? What OS version is this? How much iCloud storage do I have? 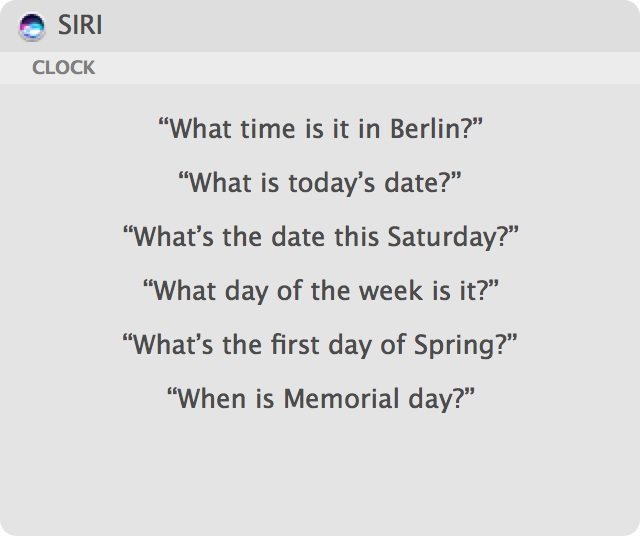 Your best bet to mastering Siri on the Mac is to simply play around with the virtual assistant, asking various questions, changing command language, asking for different types of documents or apps, requesting different information, just have fun. 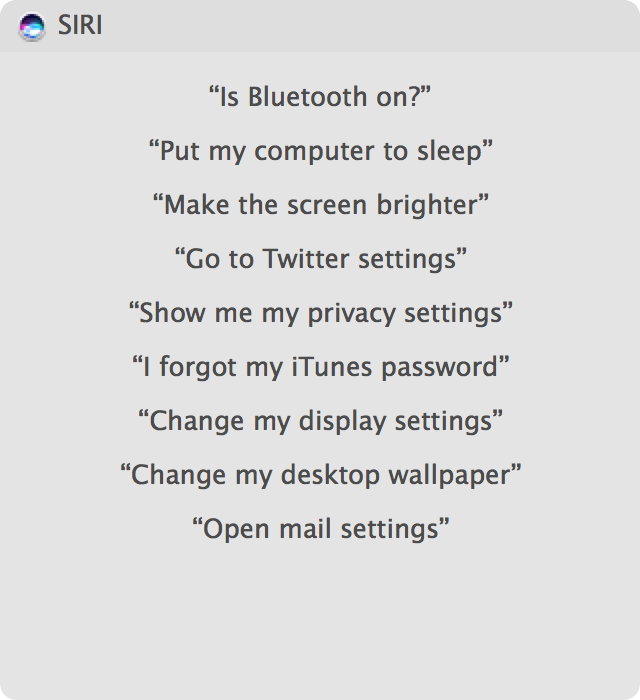 In fact, nearly every one of the commands from this Siri commands list work on the Mac as well, though obviously iPhone and iPad specific tasks and features are not possible on the Mac, though some will adjust accordingly. Explore and have fun. Another option is to ask Siri directly, what can you do for me? This works to reveal many additional command options as well, since Siri for Mac has a little help guide that comes along for the ride, you can access the details by opening Siri and pressing the info ? question mark button, or if you ask Siri on the Mac what the assistant can do for you. 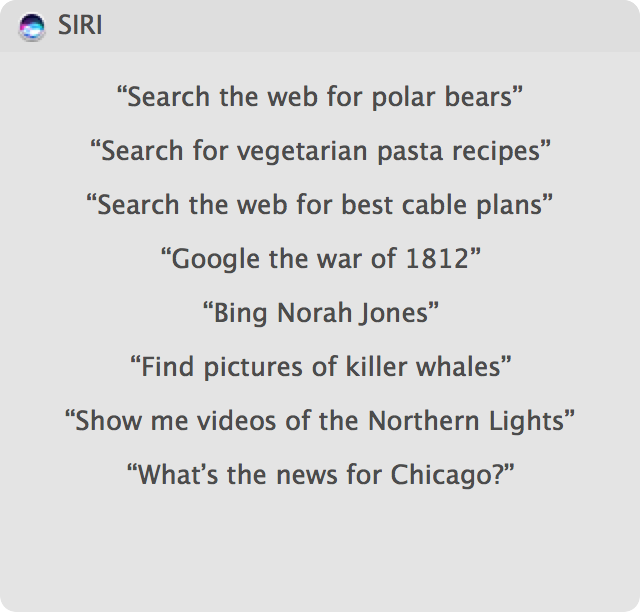 This shows a variety of menu items showing different types of commands to ask Siri, some of which are Mac specific and others which are generalized for Siri. 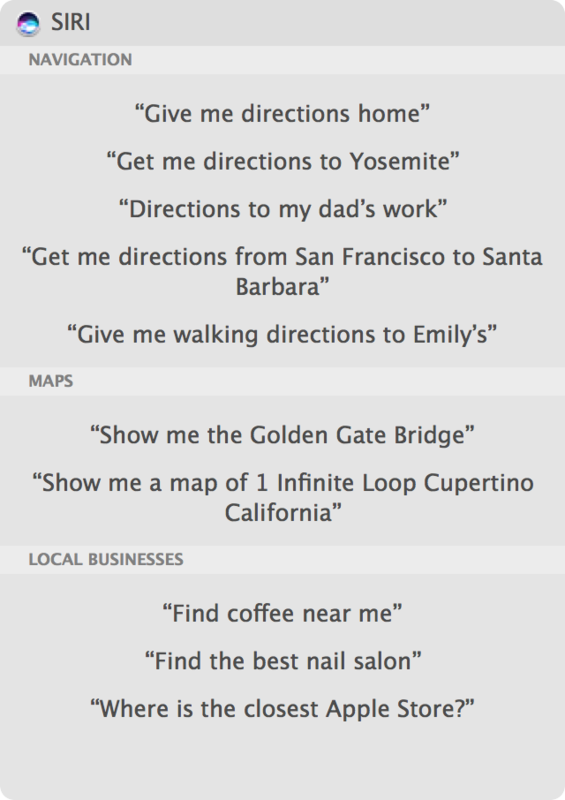 Have any particular favorite Siri commands for Mac? Let us know in the comments. Okay! This is a really long list of command. 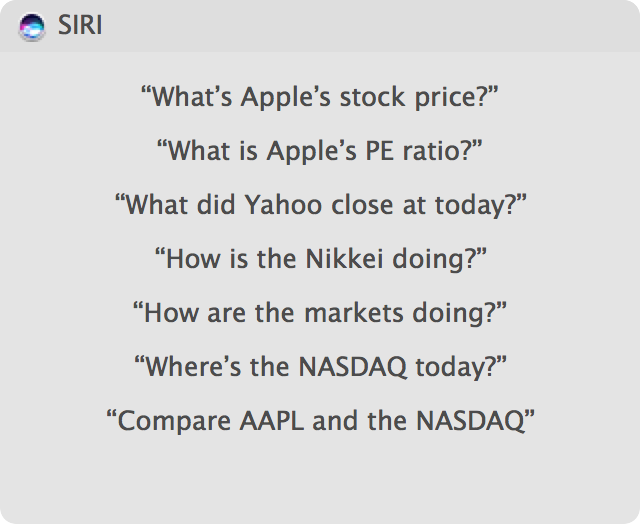 The other day, I was wondering what could be done with Siri on Mac. I am using it write notes, open apps, and even write messages using iPhone. 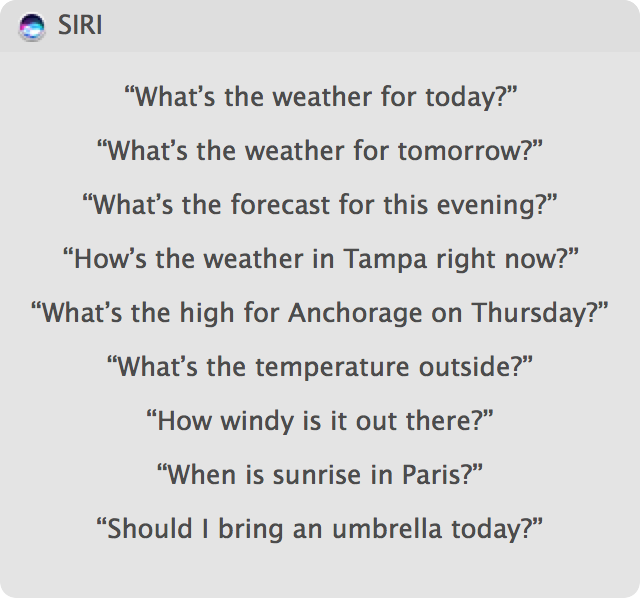 I haven’t found a use case for Siri on the Mac yet, whereas I use it constantly around the house from iPhone for getting weather, time, scores, etc. 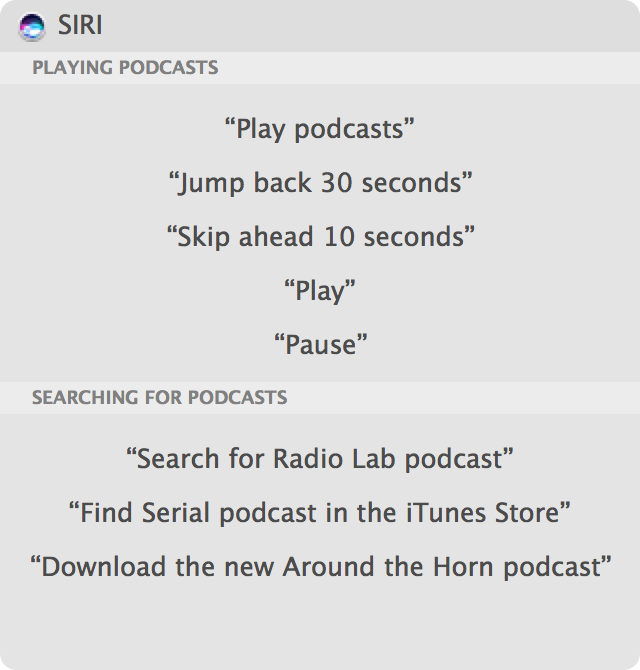 I think it’s the hands-free aspect with Siri I use the most, but I don’t know if I want Siri on the Mac listening to me all the time…. I disconnected the camera and the microphone cables. I painted over the holes with silver paint. I am not comfortable with audio and video “pipes” being connected to the computer I use for banking. Siri tell me to take a break from the computer every 30 minutes. You know what’s not too cool and all these OS updates especially on the iPhone, is Siri always says that she doesn’t have a good connection. 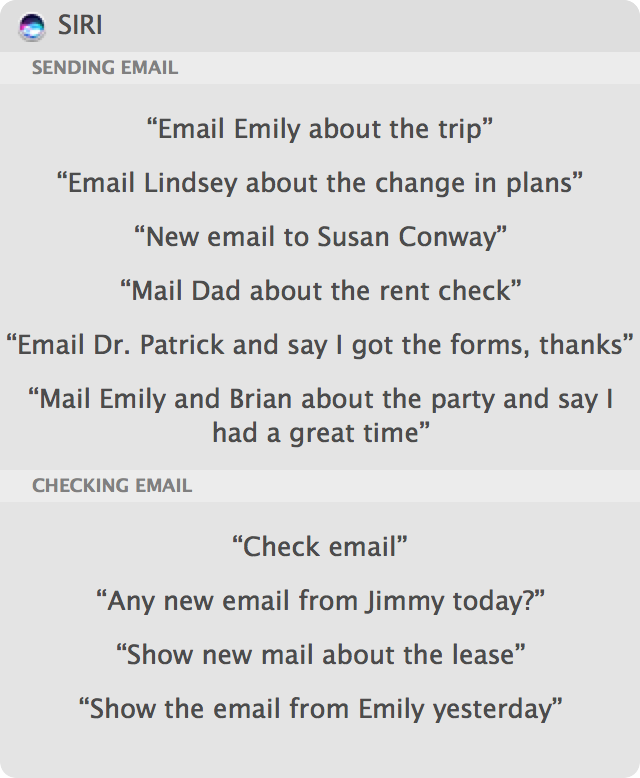 I drive for a living and I use that feature to retrieve text messages, give text messages, and read my email. 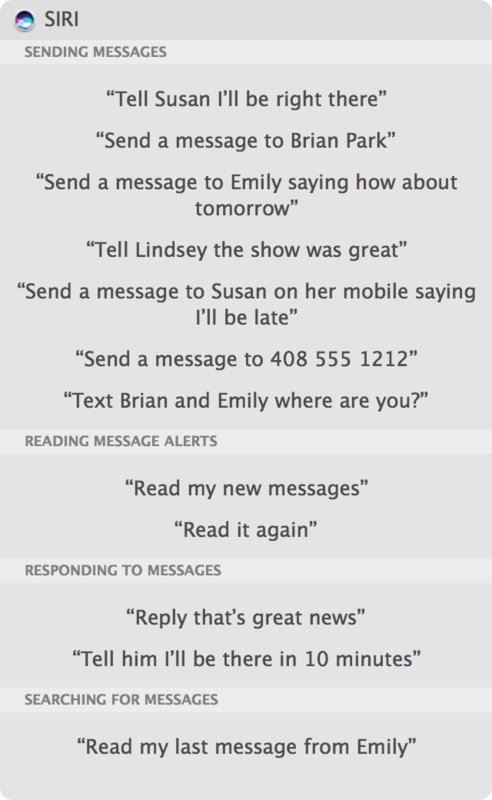 I like to do this hands-free but I’m having a heckuva time with this latest update getting a connection through Siri. I literally have to pull over and do it manually. It’s a real pain. You do realize this is an article about Siri on the mac, right? Wow. This was written in a hurry and nobody proofed it. Too many snafus to list. Typographical errors are not “snafus”. Zero. You have zero 0-day exploits. You may have a collection of ‘sploits; probably downloaded with Metasploit. 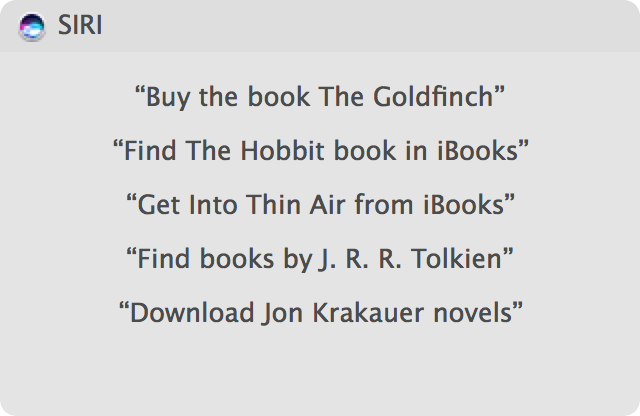 planning to ignore more generic OS X tips? So far you have. As an international photojournalist with a lot of smaller specialty and agency apps, these apps themselves don’t upgrade immediately, leaving me a new operating system that they won’t work with for months on end. Plus, privacy is a very big concern. I turn off almost all location services for that reason, save for what I need at the moment. 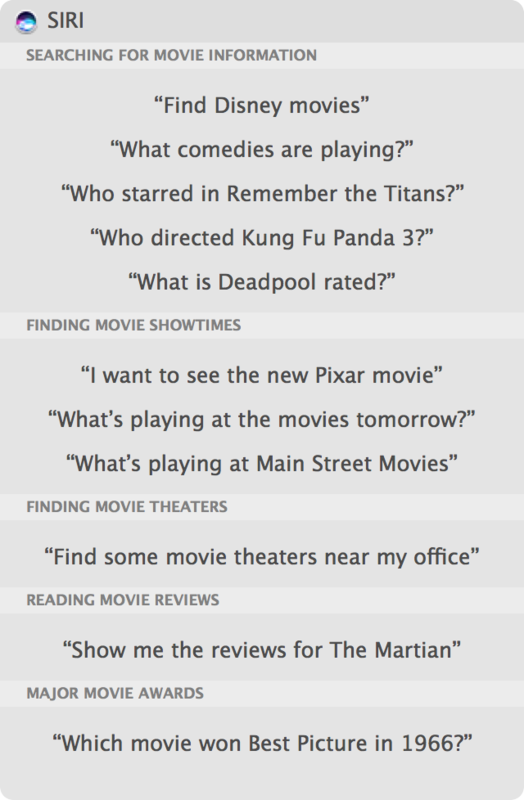 SIRI is of zero interest to me. 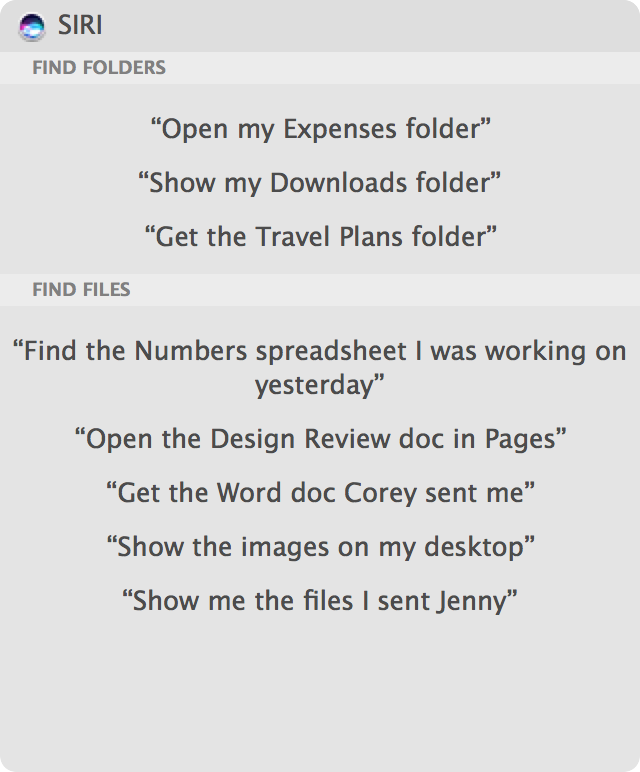 Who knew you could give Siri so many tasks via Mac. Although it’s a bit worrying that Siri is sat there listening and waiting for you… who else is listening??? 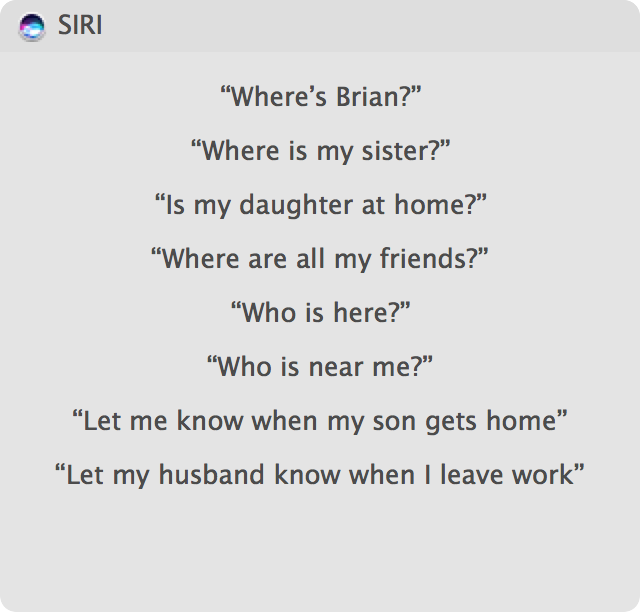 Siri on Mac is not actively waiting and listening, it must be summoned directly. there may be a mistake in this article. It says use option-spacebar to invoke Siri. This doesn’t work on my computer but cmd-spacebar works. 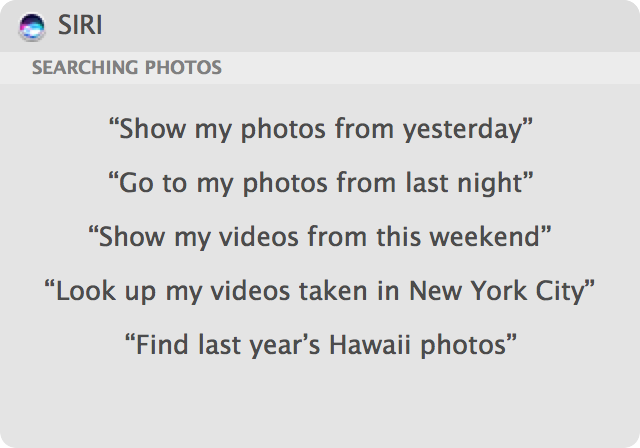 Seems some Macs default to Option+Spacebar and some to Command+Spacebar to bring up Siri, not sure why the difference. Maybe region? I think that it is funny to use, but sometime completely useless. Maybe Siri [Apple] can tell me the answer. It is very frustrating to me that Siri cannot set alarms, timers or countdown timers on MacOS. I would find these very useful features and use them a lot. Why hasn’t Apple implemented this? 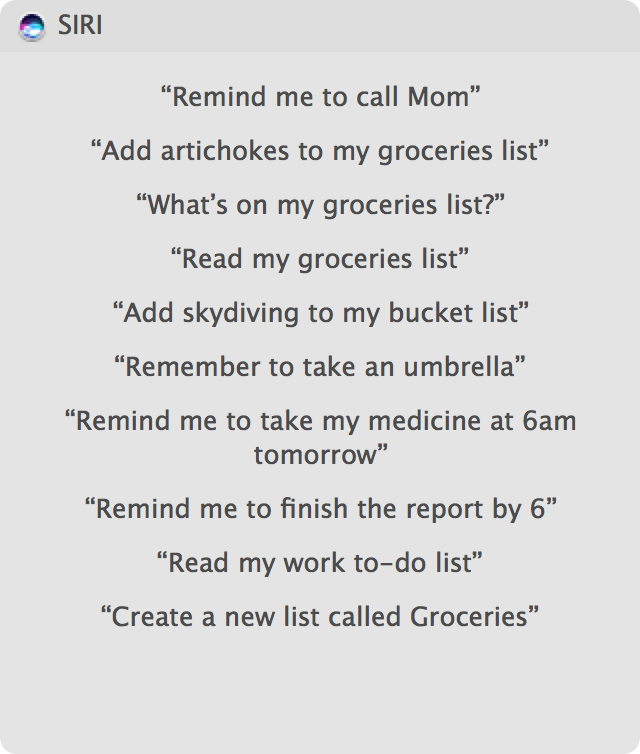 The “reminder” Siri can set is not at all useful, by the way. it is a static reminder that does not make a timer or alarm sound and does not really work as an alarm or timer. So I do not find Siri’s ability to “set a reminder” instead of just using her voice or an alarm sound of my choosing to be a good substitute to actually being able to use Siri as an alarm.